Each week we rank the best sportsman racing stories and performances from around the country. The Top 10 list provides recognition for the weekend warriors who performed at a high level. Let us know what you think and if there is someone who you feel should be included on the list. 1 – Justin Lamb wins his fifth NHRA World Championship – I’m not sure words can truly describe Justin’s dominance over the Super Stock and Stock Eliminator classes during the last two years. In 2017 Justin became just the third person in NHRA history to win two sportsman world championships in the same year (the others were Scotty Richardson and Jeff Strickland). Fast forward to 2018 where Justin won back-to-back Super Stock world championships and just missed a double-double as he came up one point shy of winning the 2018 Stock world championship. Not only did Justin win three world championships in the last two seasons, he has also killed it at the national event level winning on a frequent basis. Even though Justin claimed his wasn’t going to chase points in 2018, he did, and he did it well. 2 – Steve Williams takes the Super Comp points lead – All the talk around the Super Comp national championship over the last couple of months has centered around Don Nichols and Chris Garretson. In the last few weeks Mark Grame, Mike Robilotto, and Koy Collier pushed themselves into the conversation with clutch performances late in the season. Over the last two weeks Steve Williams, of K&N Filters fame, made a huge run at both the national event and the LODRS at Las Vegas to come out of nowhere to take over the national points lead. A fourth round finish at the Vegas national combined with a huge runner-up finished at the divisional last weekend propelled Steve to a 20 point lead over Don Nichols and Koy Collier. While he didn’t lock up the championship, his recent performances have him in the driver’s seat with only one event remaining. 3 – David Taylor wins $75,000 at SFG World Series – So here’s the way the list works, you win $75K, you make the list. Taking the three spot this week is David Taylor, Warrior, Ala., who picked up a massive $75,000 win at the SFG World Series of Drag Racing event at Silver Dollar Raceway. Although I inadvertently listed Brad Taylor in the subject line of the event post, it was David Taylor taking the event win over Aaron Vail. Congrats on your big win David! 4 – Joe Williams wins $75,000 at SFG World Series – Like David, Joe Williams collected a massive payday at the SFG World Series over the weekend. To earn the W, Williams had to take down big money superstar Gary Williams in the final round. Joe picked up the win after G-Dub turned it red in the final. Congrats on your big win! 5 – Mad Max McGlothin goes off at the Cowpasture Nationals – Mad Max went off at the 47th Annual Cowpasture Nationals at Ardmore Dragway. Max started the weekend with a No Electronics victory on Friday night and backed it up with a Super Pro victory, in the same car, on Saturday night. A blown engine finally eliminated Max in Sunday’s eliminations. In addition to his double victory weekend, Max won both the 2018 Super Pro and No Electronics points championships. 6 – Cameron Fulfer doubles at the Cowpasture Nationals – Holding down the six spot this week is another racer who had a big weekend at Ardmore Dragway. Fulfler made back-to-back No Electronics finals over the weekend and won them both. Fulfer turned back former NHRA world champion Jeff Hefler in both final rounds. 7 – Jeff Hefler makes three straight final rounds – The former world champ and President of Pro 1 Safety was out in force at the Cowpasture Nationals as he made the No Electronics final round all three days. Although he lost to Mad Max and Cameron Fulfer in his three finals, he made three finals! Hefler is a bad dude and proves every week his can drive the wheels off of a race car. 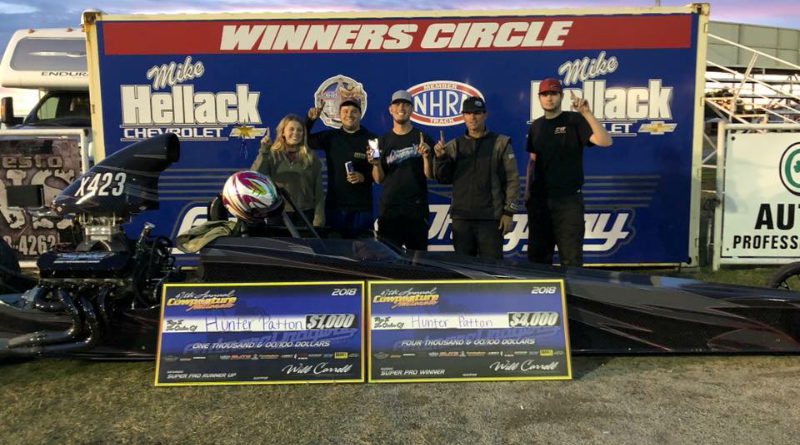 8 – Kyle Cultrera wins again at SFG World Series – After a runner-up finish last month at the SFG Super Bowl of Drag Racing, Kyle made a return trip to the final round at the SFG World Series of Bracket Racing winning the $15,000 Thursday race that actually finished on Friday. After making a big splash at the Super Bowl, Kyle backed it up with another outstanding performance at Silver Dollar Raceway. 9 – Hunter Patton makes two finals at Ardmore – Texas bracket racing ace Hunter Patton took a win and a runner-up over the weekend at the Cowpasture Nationals. After losing the final on Saturday to Mad Max, Patton redeemed himself on Sunday taking the $4,000 win over Billy Simpson. After he thought he would not be racing during the weekend, he managed to slip into Dennis Lithgows beautiful dragster and ended in in two finals. Nice way to end a weekend that started out as a spectator. 10 – Cory Gulitti and Kenny Underwood go deep at SFG World Series – Both racers followed up their recent Million Dollar race success with deep runs at the SFG World Series. Underwood drove his Firebird to a runner-up finish in the HiRoller race and Gulitti drove to a quarterfinal appearance in Saturday’s $75,000 event. In his losing effort, Gulitti laid down 15 total only to lose to eventual winner Joe Williams who got inside Gulitti with an 11-pack. That’s a wrap on this week’s Top 10 List. Follow DragChamp daily for the latest drag race results from the world of sportsman drag racing. If you don’t see your track or event covered on DragChamp, tell your track operator or race promoter to contact garydon@dragchamp.com. Make sure to share the Top 10 list with all friends (like, comment, & share).